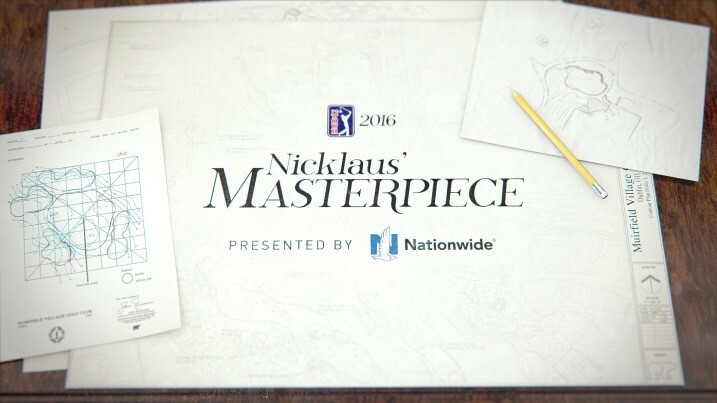 The PGA TOUR announced that an hour-long feature titled PGA TOUR 2016: Nicklaus’ Masterpiece presented by Nationwide will air Sunday, May 29, 2016 at 2 p.m. ET on CBS, prior to the network’s final-round coverage of the DEAN & DELUCA Invitational. The feature, produced by PGA TOUR Entertainment, will look at the 40 years of the Memorial Tournament at Muirfield Village Golf Club in Dublin, Ohio. The site of the annual Memorial Tournament presented by Nationwide, Muirfield Village Golf Club, has been home to the U.S. Amateur and is the only golf course in history to have hosted the Ryder Cup, the Solheim Cup and The Presidents Cup. The Genesis: From his upbringing to his college days at The Ohio State University, Nicklaus is synonymous with Ohio. This segment highlights what the area means to him and how it helped develop him both as a person and a golfer. The Course: A detailed look at all 18 holes at Muirfield Village Golf Club. The Tournament: As the lead-up to the 2016 tournament evolves, the feature documents how Nicklaus and his team prepare for the event. It will also show how both the Memorial Tournament and Nicklaus have made a lasting impact with Nationwide Children’s Hospital and other Central Ohio charities. The Legend of Nicklaus: The feature will highlight Nicklaus’ stellar career and how his legacy continues to evolve. The Nicklaus Family: This will showcase how the Memorial Tournament and Nicklaus Design is truly a family affair, including a look at wife Barbara Nicklaus, a member of the Memorial’s Captains Club and whose imprint on the club and tournament are inescapable; and the oldest of five Nicklaus children, Jack Nicklaus II, the General Chairman of the Memorial Tournament and President of Nicklaus Design. Jason Day: The current World No. 1 calls Columbus home. He shares his thoughts on Muirfield Village Golf Club, and his desire to add the Memorial Tournament trophy to his expanding collection. Past Winners: Tom Watson, Greg Norman, Fred Couples, Tiger Woods, Ernie Els, Vijay Singh, Justin Rose – and, of course, Nicklaus – are all on the impressive list of past winners at the Memorial Tournament. The Memorial Tournament presented by Nationwide is held annually at Muirfield Village Golf Club in Dublin, Ohio, a suburb of Columbus. The Tournament, founded and hosted by Jack Nicklaus, is conducted each year with three goals in mind: to honor the memory of individuals living and deceased who have distinguished themselves in the game of golf; to showcase the world’s best golfers competing on one of the most challenging venues in the world for the enjoyment of spectators; and to benefit many Greater Columbus Charities in alliance with the Nicklaus Children’s Health Care Foundation, Nationwide Children’s Hospital and numerous other local organizations. For more information, visit www.thememorialtournament.com or call 614-889-6700.